Late for work, I grabbed my coffee and slipped behind the wheel of my car. The South Unit Visitor Center at Theodore Roosevelt National Park in Medora, North Dakota, wasn't going to open by itself, so I needed to hurry. I rounded a curve to find 50 bison standing in the middle of the road, blocking my path. I stopped; I waited; they began to part, and I slowly began to drive through the herd. A large 2000-pound bull bison turned in front of me and blocked my progress. A quick glance into the rearview mirror revealed that retreat was also not possible. It was mating season. The massive bull, five feet from my front bumper, was protecting a young cow. On either side of me, bulls growled and belched a challenge to fight. I enjoyed the show from the safety of my car. 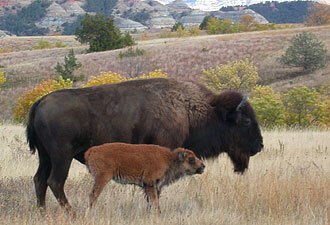 Adventures like this are common at Theodore Roosevelt National Park. Need an escape? The off-season is a great time to visit – a time of year when you won't have to share the park with hundreds of other visitors. Theodore Roosevelt National Park offers a wide variety of possibilities for a memorable visit, whether it is a day trip or an extended stay. Elk, mule deer, white-tailed deer, pronghorn, feral horses, longhorn steers, and bighorn sheep offer many wildlife viewing and photo opportunities. Prairie dogs, badgers, coyotes, and a multitude of birds, including turkeys and eagles, are frequently observed in the park. Care to be surrounded by scenic beauty? The park is in the heart of western North Dakota's badlands. It includes three areas: South Unit, North Unit, and Elkhorn Ranch Unit. Two scenic drives, a 36-mile paved loop road in the South Unit and 14 miles of paved road in the North Unit, offer a kaleidoscope of panoramic vistas. Walk portions of the 95 miles of hiking trails, see Roosevelt's Maltese Cross Cabin, explore the park's museum, and watch the short film for interesting ways to fill your days. Geologic wonders, including the nation's third largest concentration of petrified wood, rain pillars, and cannonball concretions, are common within the Tertiary Sediments. 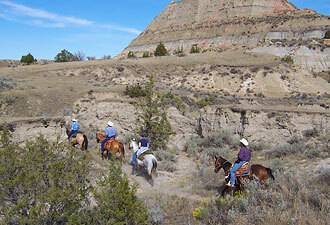 The U.S. Forest Service's Maah Daah Hey Trail, open for hiking, bicycling, and horseback riding, connects the South and North units and passes the Elkhorn Ranch Unit, deep within the Little Missouri National Grasslands. (Biking on the Maah Daah Hey Trail is not permitted within the park, but bicyclists can bypass the South Unit by using the Buffalo Gap Trail.) As the trees display their brilliant autumn foliage, the park offers good opportunities for off-season camping. The Juniper and Cottonwood campgrounds are open year-round. Early autumn daytime temperatures commonly reach the 70s, and evening temps drop to the 30s and 40s. 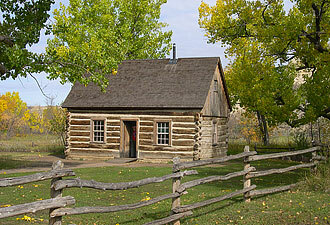 Accommodations are also available in the towns of Medora and Watford City. As I returned to my ranger cabin that evening, a majestic bull elk leading a harem of eight cows crossed the road in front of me. Nature's wonders never seem to cease at Theodore Roosevelt National Park. Pulling into my parking spot, I placed my ranger hat on my head and rounded the corner of my cabin – I stopped dead in my tracks – there he stood – that big bull bison had tracked me down. Come visit. Theodore Roosevelt National Park is one of the National Park Service's best kept secrets, but it's one we are eager to share.